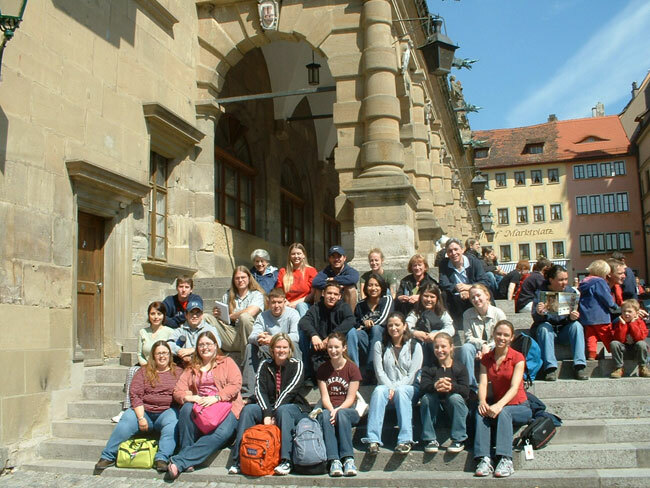 SHSU faculty and students gather in Germany during a break from their lectures. A unique combination of two scientific fields at Sam Houston State University has resulted in a course that is drawing an enthusiastic response not only from students, but from educators outside the university as well. Rick White, professor of chemistry, and Janis White, professor of family and consumer sciences, have created the course, “Discoveries in Chemistry and Textiles,” and its development was featured in the Dec. 1, 2008 online edition of The Chemical Educator. The article is written by the Whites---a husband and wife team, SHSU assistant professor of chemistry Darren Williams, and the Whites’ son and daughter-in-law, John, a graduate student who teaches German in the department of foreign languages and literatures at Purdue University, and Maria, also a graduate student who teaches English composition and literature at Purdue and speaks French. The educators lead a group of students to Germany and France between the end of the spring semester and the beginning of the first summer session in odd numbered years to study the major research of prominent scientists, historical events which influenced their work, and how their efforts continue to impact the world today. An added bonus is that prior to traveling abroad, students attend “pre-trip classes” where they are prepared to conduct themselves as courteous international visitors and to observe the similarities and differences between the Americans and Europeans. The course consists of 18 lectures as well as visits to course-related locations. Among the sites the students visit in Germany are Wilhelm Röntgen’s laboratory where they see the instruments he used to discover X-rays; the physical address in Köln where cologne was developed; and the University of Heidelberg where Robert Bunsen’s building of the first spectroscope is commemorated. Lecture topics while they travel in France include the lives of Pierre and Marie Curie and the contributions for which they were awarded the Nobel Prize; Louis Pasteur and his work with silkworms; and Count Chardonnet and the invention of artificial silk. One of the advantages of the course’s format comes from being in the location where the work was done, thereby reinforcing the material in the lectures, noted Janis White. “Whenever we tour the museum dedicated to the work of the Curies, you can almost feel their presence,” she said. Students also have the option of touring Fashion Avenue in Paris where the professors stress the connection between chemistry and textiles. One of the major components of the course is the discussion of historical and cultural events in Europe as they travel to different locations so that students will have an understanding of why scientific discoveries developed and what influenced researchers at the time of their discoveries. “In our lecture on Fritz Haber and World War I, we talk about his efforts in synthesizing ammonia and his argument for the use of gas warfare to quickly win the war,” Rick White said. “We compare that to arguments in favor of using the atomic bomb in the Second World War. Study abroad has been a highly valued concept in education for hundreds of years and is considered to greatly enhance the traditional classroom experience. Even though the interdisciplinary course did not result from a traditional combination of studies, the Whites had support from SHSU administrators from the beginning. “Sam Houston State has a wide variety of programs for giving students international experiences,” said Provost and Vice President for Academic Affairs David Payne. “These educational programs delivered at international sites give many students their first glimpse of a larger world. Returning students almost always say that it has been one of the highlights of their lives,” he said. “Students gain varying degrees of fluency in other languages, experience another culture firsthand, come to appreciate their own culture, make friends for a lifetime, better prepare themselves to compete in what is becoming a global economic system, and bring to other students at Sam Houston a richness of understanding born of experience,” Payne explained. “The program provided by Drs. White is wonderfully conceived and carefully planned to ensure that students have an exceptional experience,” Payne said. The upcoming “Discoveries in Chemistry and Textiles” course this May is already filled with students from a variety of majors. One is Madison Hausinger, a forensic chemistry major from Houston. Hausinger is a first-generation American whose family came to the United States from Germany. Another student, Kristen Schroeder, will be going to Europe for the first time. A biology major from Houston, Schroeder plans to attend medical school after graduation. She is looking at the course as a way to help her when she begins her career. “Traveling is a good thing to talk about in an interview,” she said. Information about study abroad programs at Sam Houston State University can be obtained from Reiko Clark in the office of international programs at 936.294.4611, or from professors leading specific programs.